I feel reluctant to get one of these now - I'm more the economical hatchback, stay in the left lane type. Nice review. You should still get one. They are very nice machines. Just not the end-all. I personally feel that this typewriter is the typewriter version of a langue chair. Soft, comfortable and the mind of place we wish we could do our work. As opposed to the office chair SM series, which are refined, purposeful, and quick to get in and out if. I didn't know they made any in Hungary! I have mixed feelings about the H3K. Pros: oustanding alignment, smooth carriage (when well adjusted), good quality control at the factory. Cons: finicky, overcomplicated mechanisms (like that margin indicator in the paper bail), a carriage that's a bear to get back on after you've removed it, lack of speed (I disagree with the BMW analogy in this regard -- you feel every keystroke cranking the ribbon more than on other machines, and you don't get a sense of acceleration on the keystroke) ... and then there's that hospital green-gray color that I can't love. I bought one (1964 rounded one) when I had a chance, tried for a while but couldn't warm up to it. Quite a good typer, smooth carriage (I was lucky here I guess) but not my cup of tea so I passed it forward. Since I got mine for $6.99 (1961, in techno - excuse me - senatorial) I don't know about paying a c-note. But it is still, 50-plus machines later, my favorite for touch. 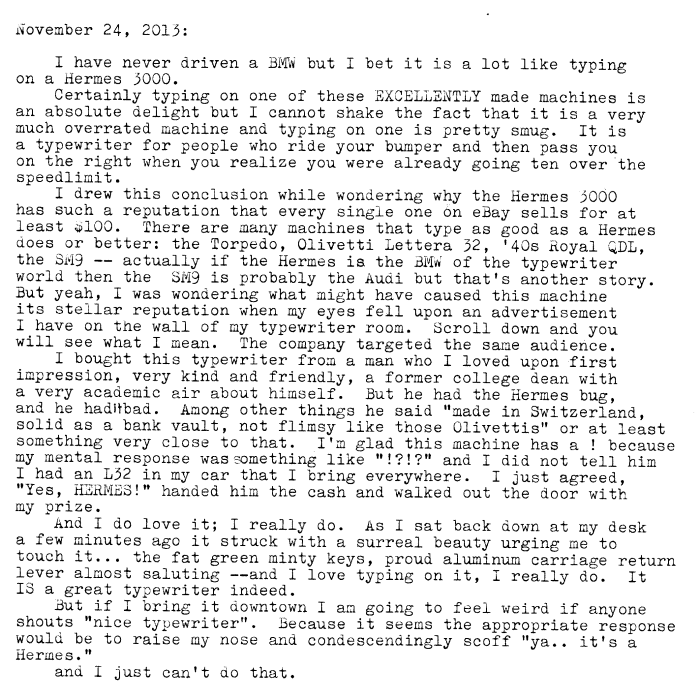 It was my third-ever typewriter - I had only a 46 Underwood and a script SM9 at the time. Your post is hilarious. Funnier still because mine needs the space bar tightened back on so I'm splitting time between all my Olivettis and my SG1 as a result of that problem. Anyway, as the saying goes, "De gustibus non est disputandum" or something. Not the very best typewriters made, but certainly one of my favourites. After all, I want to own three of them so that says something. Oh also, regarding Richard Polt's comment, that insane amount of ribbon advancing comes in very handy with a carbon ribbon. The only completely failproof portable I've yet used with a carbon ribbon. I have owned two H3K's (as they're called) and liked them a bit. They are NICE typewriters, but I just don't appreciate their feel as much as most other people seem to. I have since sold both of them...the profit margin on those things is insane. The reason I probably didn't like them very much is because I'd just never use them. Why would I, with all of these SM9's around? Olivetti is my benchmark but I understand your Hermes love. It has a signature feel to it and I mean that in the best sense. I love the rounded contours (and color!) of the 50s variant. It's hard to translate elegance to a typewriter but Paillard-Hermes succeeded with the Hermes 3000. Great desk setup, by the way. Please check your email (got it from Richard), sent a message that might interest you. 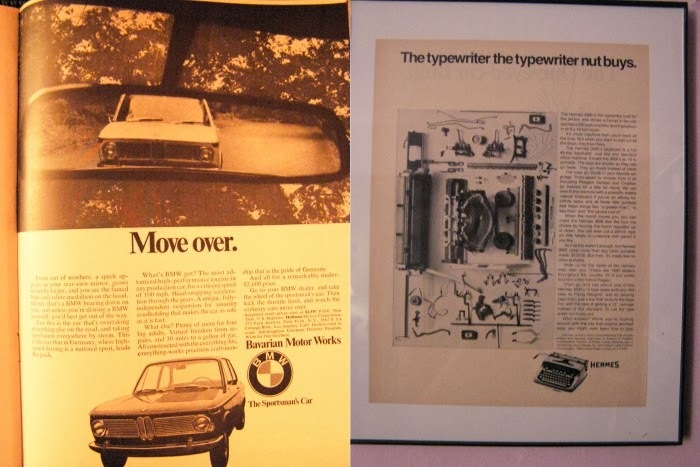 I have one of these, and it is the most over-engineered, over-complicated, and over-rated typewriters ever. It has a nice action, but stupid things go wrong with it, especially because of its hub arrangement--who designed that? Hey I was wondering how I can contact you. I wanted to email you about a Remington Rand I have. Just wanted to find out some info on it. thanks! I think in the end our individual impressions of our typewriters depends on whether they work or not. And by working, I mean simply doing their job without onerous quirks that break our flow of thought. No skipping, no lazy carriage toward the end of the line, no randomness of the left margin, ribbon advances (and reverses) without attention. I rotated through my typers while doing my Christmas notes - Lettera 32, SM9s, Studio 45s included, and in the end settled with the 3K. Because it just worked. I missed this post when you first posted it. I was on the road and seldom read blogs, nor did I post. In any case that is quite a collection of H3k machines. At last count I think my Skyriter quantity matches my H3k quanitity. 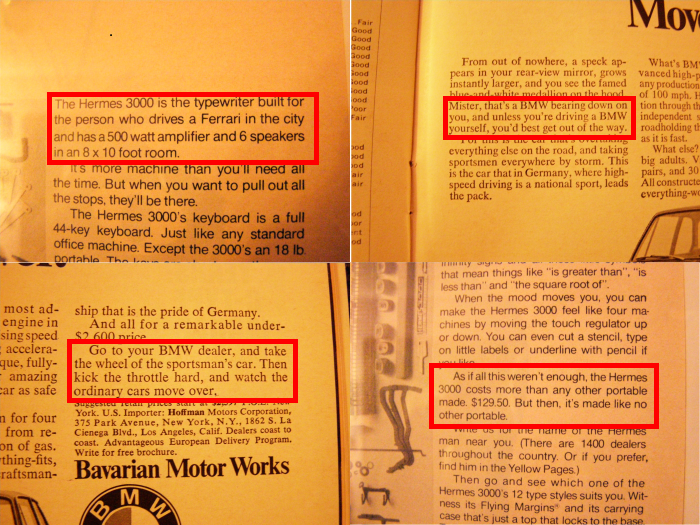 I do know the Germans I worked with did not like BMWs. I was never impressed with them either. Love my Audis. I too think the Hermes is over rated as are the Olympia machines, but I'll take a 3000 ove any of my Olympia machines for good qualtiy and nice typing. Once you find a really good Hermes it will be hard to beat. I have 2 like that. Both are the first style rounded ones. The later squared ones just do not type the same. All have the cheap stamped and formed aluminum foundations though. This makes them fragile, but allows me to buy them for next to nothing, take the works apart and reform the sides in the machine shop at work. Even though an H3k is a bit over rated (and very over priced on line) I generally will pick one of the old ones as my machine of choice if I have any amount of typing to get done. I do believe I also have found two really good Hermes, both curvy body ones, and they are excellent but not to the point that they should command the prices that they do. They are no better than other excellent typing machines like the Lettera 32 or 40s Royal QDL or SM9. None of those machines garner the insane prices or laud and praise that the Hermes seem to.